Among many other benefits, requirements management tools can increase staff productivity and decrease operation costs. They have the potential to enhance your product development, making sure the products you build fit the requirements of customers and therefore become successful on the market. To calculate the benefits, let’s look at the ROI elements of Requirements Management tools. 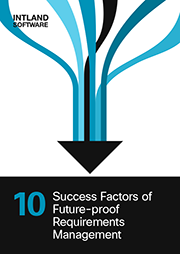 Return On Investment (ROI) is a popular method to measure the success of process improvements and IT investments. The simplest method is the Benefit to Cost Ratio – this is obtained quite simply by dividing the benefits with the costs. So what's a simple calculation for measuring the efficiency and savings of a better Requirements Management toolset? This model is based on Dean Leffingwell’s More Effective Requirements Management. First, you'll have to count the staffing cost per project. In our example, this is 2,400,000 USD. Then calculate with an industry average of rework as a percentage of the total project cost. That's around 30%, or about 720,000 USD in our example. The requirements-related rework of the total rework is generally about 70%. So the cost of requirements rework due to inefficiencies is about 504,000 USD. If we consider that the minimum improvement ratio is 10% after implementing a good Requirements Management tool, the cost saving is 50,400 USD (504,000 USD x 0,1). 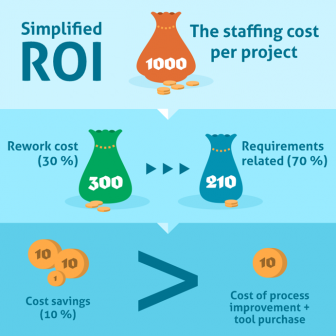 If you divide the cost saving by the investment (the purchase price of your Requirements Management tool), you can very easily calculate the ROI. However, the investment cost of the tool can vary depending on each vendor's pricing strategy. How many pages of requirements can be created within an hour per person? How many of the described requirements are finally implemented? How inefficient is the staff (lost data, lost notebooks, not saved work etc.)? It is generally said that the ROI of implementing a good Requirements Management tool is dependent upon the size of the project, the number of involved staff, and the number of requirements that has to be managed with the tool within the time period of 3-12 months. Evaluating requirements management platforms to update your toolchain? Give codeBeamer a try, ot get in touch with us to have all your questions answered!